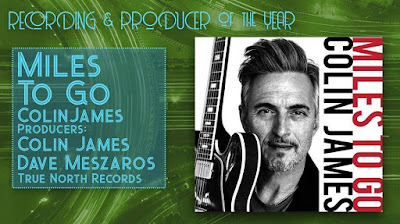 Canadian Blues legend Colin James swept the Maple Blues Awards with 5 wins. He was a similar face at the podium during the ceremony on February 4, 2019 at Koerner Hall in Toronto. His fabulous recording Miles to Go features Hamiltonians Jesse O'Brien (keys, writing), Steve Pelletier (bass) and Tom Wilson aka Lee Harvey Osmond (writing). Also, it's released by Waterdown's True North Records).